I just checked and found out that this blog is the 760, 243rd most popular site in the United States. Watch out number 760,242 because I’m hot on your trail! Anger is by nature designed for waging war with the demons and for struggling with every kind of sinful pleasure. Therefore angels, arousing spiritual pleasure in us and giving us to taste its blessedness, incline us to direct our anger against the demons. But the demons, enticing us towards worldly lusts, make us use anger to fight with men, which is against nature, so that the mind, thus stupefied and darkened, should become a traitor to virtues. to pray for the world. No judgements. No fears. Please God, fill in the blanks as only You can. What is grace? It is the blessed power of God. . the power that cleanses, sanctifies, enlightens, that helps in doing good and withdraws from evil, that comforts and gives courage in misfortunes, sorrows, and sickness; that is a pledge of receiving the everlasting blessings, prepared by God in heaven for His chosen ones. Four services, four shows. I’m tired to the bottom of my feet but grateful to God for the strength to make it through. Constant repetition has made the music flow. Services in different jurisdictions has been the best possible education. I have no idea where all of this goes, but today is good, tired and all. 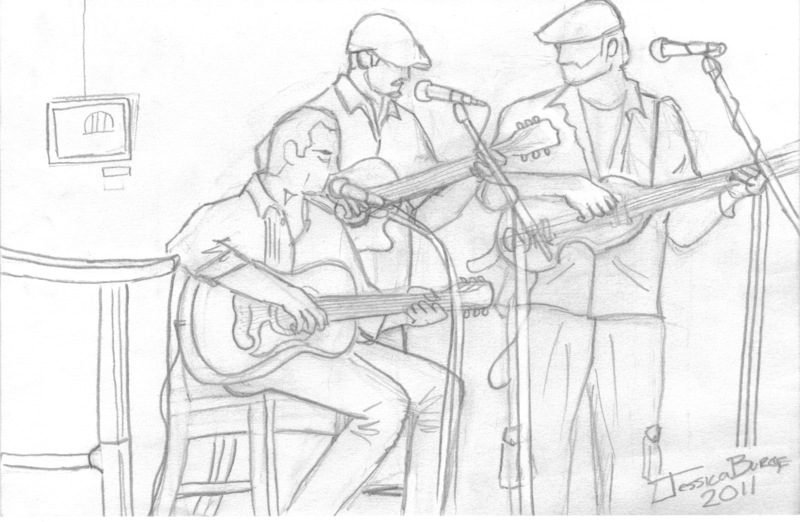 Here’s a sketch of “Shoulder to the Plow” last night at the Dunn Brothers Coffee Shop. I’m on the right.